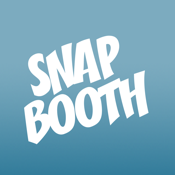 SnapBooth photo booth & selfie machine is an absolute must-have iPhone and iPad app for all you selfie superstars out there who want to capture precious moments in a simple and convenient manner. I really like the idea behind this iPad and iPhone selfies app because it strips away all the unnecessary clutter that a lot of photography apps come with, leaving you with exactly what you need to capture great photos, unhindered by a clunky interface or gimmicks. Making an effective no-nonsense entry into the Photo & Video category of the App Store is this awesome photography app that will allow you to take incredible social media-friendly selfies with ease. All you have to do is tap the screen, wait for the countdown, and say CHEESE! Before you know it you'll have the perfect selfie, making this app suitable for individual photos by yourself or for capturing fun moments with your friends and family. SnapBooth photo booth & selfie machine lets you share your photos with others online via Facebook, Twitter, and email, and you can even include text descriptions with hashtags and @ tags depending on where you want to post your pictures. It amazes me that something as simple as a countdown timer hasn't been implemented in the standard iOS Camera widget but on the bright side it means you get to use a cool iOS 8-compatible app like this! Simply tap the screen, wait for the countdown, and say CHEESE! SnapBooth photo booth & selfie machine is definitely worth checking out on your iPhone and iPad if you have an upcoming social event where you want to take lots of pictures with your loved ones.